The effects of slight rises in mortgage interest rates may seem insignificant, but they have very real impacts…not only on a Bozeman Buyer’s purchasing power, but on sales prices as well. As interest rates rise, they increase the monthly mortgage payment: For Buyers that can qualify for a certain monthly payment, the price of what they can afford goes down. 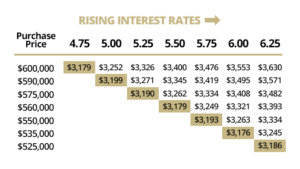 So, if you are thinking of buying later as prices in Bozeman real estate soften, remember this: rising interest rates will offset that softening in prices, and your payment will remain the same even as prices go down. Or, if rates rise significantly, you will be able to afford less of a home…Keep this in mind as we see prices in Bozeman real estate start to come down, just as interest rates rise. For anyone who wants to know more about the current Bozeman real estate environment, email me to be set up on market alert.